Our charters features the luxury sailing yachts, Oceanaire, a 48′ Tayana. Oceanaire was chosen for luxury with your comfort and enjoyment in mind. We continually invest in and maintain our fleet meticulously. 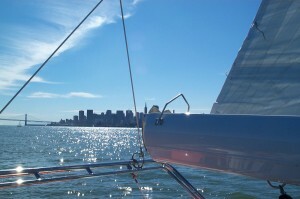 Our yacht is unsurpassed in the Bay Area. We can also arrange luxury motor yachts up to 65′ or motor yachts accommodating up to 40 people subject to availability.